Start the New Year off with a hike. Many state parks across the country are participating in the First Day Hikes program. The program is aimed at promoting healthy lifestyles throughout the year and recreation at state parks. Participating parks will have guided hikes on Jan 1 for people to begin the year. 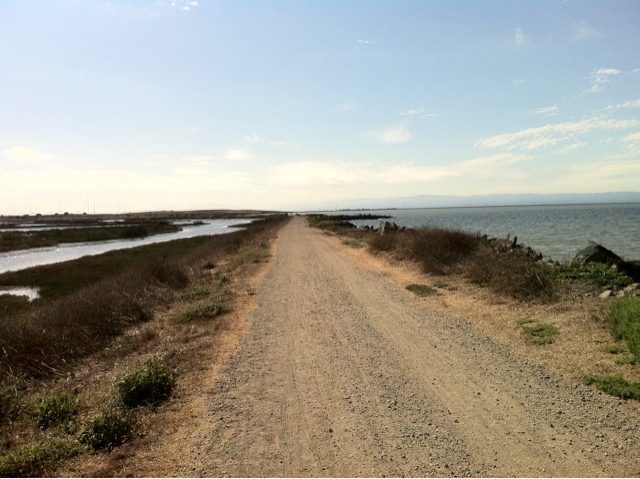 Local parks include Big Basin, Henry Cowell, Ano Nuevo and more. So get out there and embrace the outdoors in the new year. For the second year in a row I ran the Calfornia International Marathon (CIM) from Folsom to Sacramento. It was my second time running CIM, and my second time running a marathon. When I ran CIM last year I was very nervous with it being my first marathon. Although I did feel much better at the finish than I thought I would, it was the most physically and mentally grueling thing I had ever been through. As my sore legs carried me back to the car after the race I was asked if I would do it again. I think I said something along the lines of "Nah, I'm glad I did it once and now I can say I did a marathon but I don't think I'll do it again". Well, as the soreness dissipated and time went on I started thinking about doing it again. Maybe if I continued to train I could beat my time. That thought became more and more appealing so after a few months I registered for CIM again. Aside from the marathon there was a four person relay and a 2.62 mile marFUNrun in Sacramento. Over 14,000 participants took part in the events. Bib pick up was at an Expo at the Sacramento Convention Center. It took place the Friday and Saturday before the race. Bib pick up was well organized but there did seem to be a lot of stops. First I got my bib and timing chip, then made another stop to check my timing chip to make sure it was programmed correctly, then made another stop to get my shirt and goody bag which doubled as my sweat check bag. Along with bib/shirt pick up there were various vendors at the Expo selling running clothing and gear. There were also several booths promoting upcoming races. There were also free cliff bar samples of new and popular flavors which were good. There was also a Medical Symposium and Marathon Speaker Clinics where speakers discussed various topics related to marathon running such a preparing for CIM, avoiding injury and motivation. After the Expo we headed out to Folsom and did a little shopping before dinner time. Last year we had eaten at a well known Italian restaurant but we ended up waiting about 40 minutes and were disappointed with the food so this year we opted for pizza and it was great. After dinner we headed over to our hotel to check-in. We stayed in a hotel in Folsom again this year and glad we did because they had the VIP warming tent for Folsom guests again. The night before the race I laid out my clothes and gear and went to bed early. Weather for the weekend was expected to be cold and clear. I was thrilled since it was a rainy weekend the year before, even though it didn't really rain during the race. On the day of the race I got up really early after a bad nights rest. I kept waking up during the night worried that I would oversleep and miss the race. My plan was to wake up at 4:30am to be on the shuttle bus at 5:15 but I was wide awake at 3:30am and just kept going through my mental list of things to take. I finally got out of bed and got dressed. I had packed my extras like sweats, water and peanut butter sandwich in my sweat bag so I wouldn't forget them on race day. Just before 5am I made my way down to the hotel lobby where they were serving breakfast. They started it at 4:15am, much earlier than usual, because of the marathon. 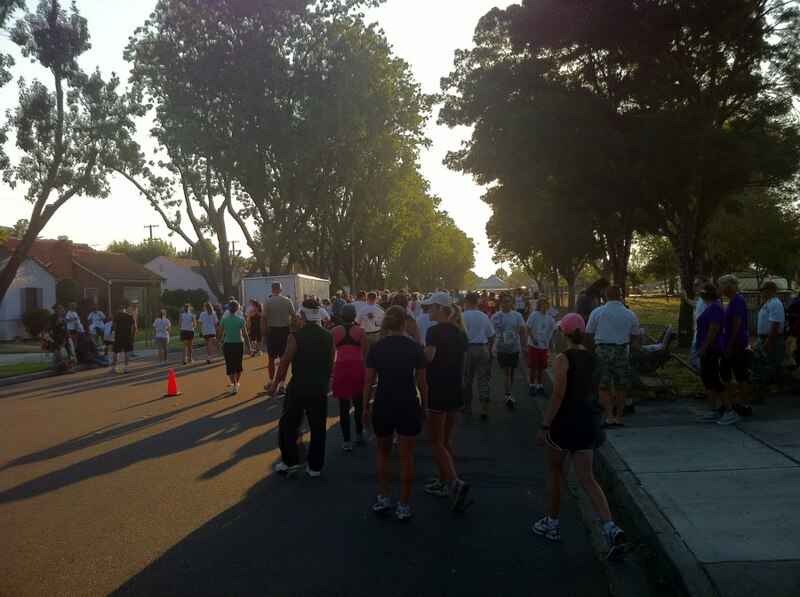 It was great for the runners participating in the race. I sat and ate my peanut butter sandwich and grabbed a banana for later. When registering for the race there was an option to pay $10 to take a shuttle bus from the hotel to the race start and I had opted for that. The "shuttle bus" (school bus) arrived at about 5am and seats began to fill soon after. It left the hotel at about 5:20 and made the drive over to the start. Last year when we had arrived we were one among several buses but this year we were the first ones to arrive. Although it was still dark, I could see Folsom Dam from the bus itself. We were given the option to stay on the bus as long as we wanted but most of us got off the bus and made the short walk to the warming tent. It wasn't too warm to start but warmer than just standing outside in the 27 degree air. Several chairs were set up in the tent and 6 portapotties were lined up just outside the tent. Like the warming tent, the portapotties were for use only by the Folsom guests. If I continue to run CIM the VIP Folsom area would be reason enough for me to stay in Folsom again. Back to the race. Race start was scheduled for 7am so I ate my banana at about 6:15 and started getting my gear together soon after. After a couple of bathroom stops I made my way out of the tent into the cold. I shed some layers of clothing and packed it in my sweat bag. There were three big rental trucks used to transport the sweat bags to the finish, they were organized by bib number. I gave mine to the appropriate truck and then started making my way towards the starting line. The sun was just starting to come up as I found the pace group I was planning to run with the 3:55 group which included Diedre Fitzpatrick. My goal was to finish under 4 hours. Someone sang the national anthem and just as we were about to go I took off my last long sleeve shirt and tossed it away from the crowd. It took me about a minute and a half to cross the start line and then made a quick right turn. It was right then that I got a little ahead of the 3:55 pace group and never saw them again. The course was the same as last year, the same as it has been for the last 29 years. As I went through Orangevale, Citrus Heights, Fair Oaks and Carimichael I passed several spectators cheering on family members, friends and strangers. There were a couple of firetrucks with fireman hanging out of windows and offering high fives. I ran along Fair Oaks Blvd, close to the American River. The weather was great-cool and sunny. It was perfect. As I kept running I noticed that I was on pace to finish closer to 3:50. I was exhilarated. Even though the first 17-18 mills consisted of rolling hills I was still on pace to finish close to 3:50, if I could just keep the pace. At the 20 mile marker there was a fake brick wall that represented hitting the wall in the race. Thankfully I felt surprisingly good. After crossing the Fair Oaks Bridge the course headed through the streets of downtown Sacramento leading to the finish at Capitol Park. There were about 18 aid stations on the course route, each with water and Ultima sports drink. The first few stations were very crowded but this year it was much easier to distinguish between which volunteers had the water and which had the sports drink. It was always water first, Ultima second. Last year I had a difficult time finding those with the water in the first half of the race. GU energy gels were provided at around mile 13 and 20. Gels were supposed to be offered at about mile 23 as well but I must have missed it. I had GU's and Honey Stinger energy chews of my own so I was fine. There were also a few areas in the last half of the race where orange slices, banana slices and licorice were offered. Portapotties were sparse in the first several miles but as I got closer to the finish they seem to be everywhere. Spectators lined much of the course with the usual cowbells and motivational signs and there were bands at certain points, ranging from high school marching bands to local rock bands. There were three relay exchange zones which were very busy with the relay participants as well as spectators. Race organizers did do a good job of keeping the course clear for the runners and making it clear where to go if you were a relay participant. Relay chutes were always on the right and marathoners always continued on the left side of the course. The finish line at the Capitol was great and there were tons of spectators. There was a separate finish chute for men and women. After crossing the finish line I looked at my time-just under 3:50, woohoo! A volunteer put a finishers medal over my head while another gave me a blanket, someone then removed the timing chip off my shoe, and then I was ushered towards some chocolate milk, it tasted spectacular. I got some water and then waited my turn for my finishers photo to be taken with the official CIM backdrop. I met up with my family and made my way to the food area. I was in and out quicker than last year. There was fruit, bagels, cookies, tomato soup and freshly made pancakes. I got my food and ate as I walked towards the sweat bags on the lawn. Sweat bag pick up was a little further than last year but it felt good to just keep moving. The sun was out, it was in the 50's, it was great. I felt better physically and mentally than I expected and better than last year. After getting my sweat bag we headed to the car to head home. Once again, the race was very well organized, from the expo to the course itself, to the post race food and sweat bag pickup. The course is nice and despite the rolling hills it's a fast course with an overall elevation drop of just over 300 feet. Can't wait to do it again, maybe I'll set a new PR next time. 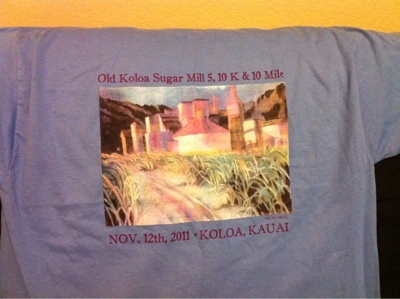 While vacationing in Kauai we were lucky enough to participate in a local race, the Old Koloa Sugar Mill Run. 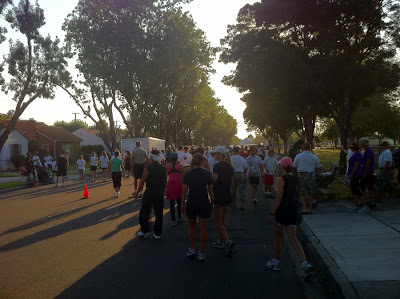 The proceeds from the run went to scholarships for various programs at Kauai Community College. We hadn't originally planned on doing this but while waiting to pick up our luggage at the airport I picked up a brochure with "things to do" in Kauai and while flipping through it the next day I found out about the race. It was taking place in a few days and just a few miles away from where we were staying. It was a 5k, 10k and 10 mile. Online registration was available as well as same day registration. Since we would be flying home on race day we weren't sure initially if we wanted to do it, seeing as we would be in a rush to pack our bags, check out of the hotel, then go catch a late morning flight. Two days before the race we decided to participate. After all, when would we get another chance to do a race in Kauai? We both had planned on running about 6 miles on that day anyways so we signed up for the 10k. Online registration was easy except for the Wi-Fi connection at the hotel. We paid $30 each and surprisingly there was no additional fee for online registration. 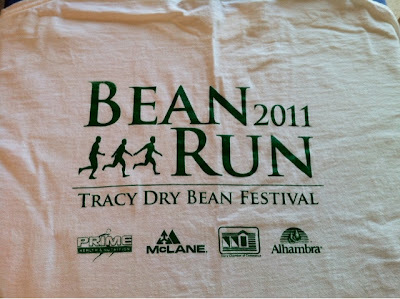 The registration included a race t-shirt or tank top (we got to choose) and a post race continental breakfast. Race packet pick-up was available the day before the race so we made the 20 minute drive to a shopping center in Lihue. 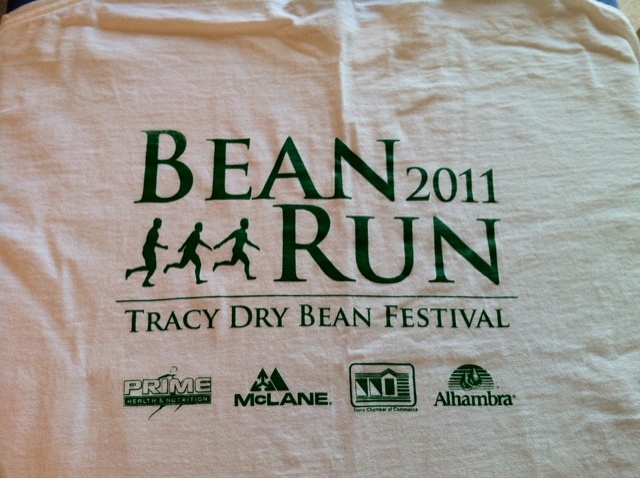 There we were able to pick up our bibs and t-shirts. The night before the race we packed as much as we could knowing that we would be short on time the next day. On race day we got up early and packed a few more things before getting ready for the race. We headed out of our hotel and drove a few miles to nearby Anne Knudsen park which was basically race headquarters. About a block away was the race start and finish. There was a very small lot at the park so most people, including us, parked along the street on the narrow shoulder. We walked over to the start and waited. 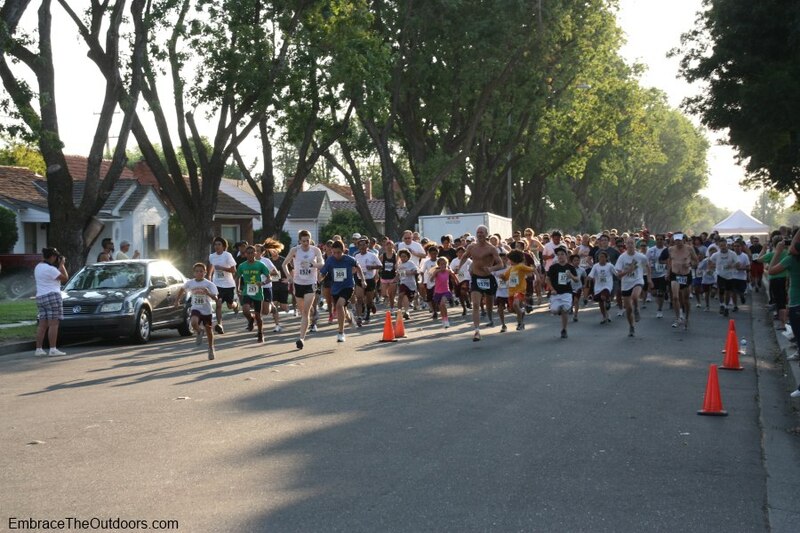 The 10 mile participants started first at 7am, the 10k was next at 7:15 and the 5k was last at 7:30. Quite a few people lined up for the 10k but it didn't feel crowded since the race was not chip-timed and there was no timing mat. The course for all three distances headed south on Ala Kinoiki Road, a two lane paved road that was closed for the race. We then turned onto a narrow dirt road towards the old sugar mill. The road was muddy in some areas from the recent rains (it rained daily while we were in Kauai) so we just had to be careful not to misstep, although I did miscalculate at one time and ended up stepping in a puddle. After doing a loop on this dirt road we were back onto Ala Kinoiki Road and continued south on it before reaching the 10k turnaround and heading back on the paved road to the finish. The course was well marked with signs and because there were very few turns it was an easy route to follow. There was lush green foliage lining the course and you could see the mountain in the background on the way back towards the finish line. There were three water stops for the 10k which were appreciated in the humidity of Kauai. The temperature was in the 70's for the race and it was definitely humid. We were glad we were doing this at the end of our trip since we had some time to acclimate. The finish line was marked with cones but there wasn't an official mat to cross since it wasn't chip-timed. There weren't separate chutes for the different races either which made it a bit confusing and also made for congestion at the end. We think this probably paid a part in incorrect race results too. After finishing we walked back over to the park where breakfast was being served from the snack bar. We lined up and got our breakfast burrito (vegetarian or not), fruit, croissant, juice/coffee and yogurt. It was a hearty breakfast and the best one we've had from a race yet. Awards were to start at 9:15 but we asked after eating and were told they would start at around 9:30 or so. Since we were pressed for time but didn't want to miss the awards we rushed back to the hotel, showered, packed and rushed back. We made it back in time. They were finishing the 5k results as we got there and they moved on to the 10k shortly after. We noticed something was wrong with the results when a few people returned their ribbons and when people we were fairly certain did not participate in the 10k had fast finishing times. Nonetheless I got my ribbon for my age group finish and rushed out to make the drive to the airport to head home. The race was really convenient and we were lucky it was so close. There were local participants, several participants from the mainland and even a few international participants. The course was well marked, registration and bib pick-up was easy and the breakfast was great. The only thing we would change is the timing of the course and the incorrect finish results. Regardless we can now say we ran a 10k in beautiful Kauai. 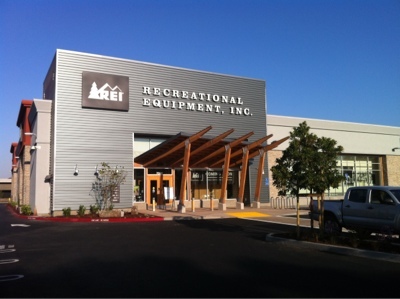 The REI Dublin grand opening is finally upon us. 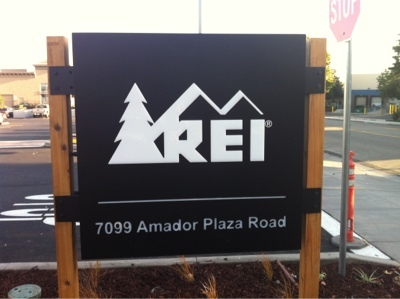 The new store is located at 7099 Amador Plaza Road in Dublin, CA. Opening day is Friday, October 28th but they are celebrating all weekend long. They will be having a free continental breakfast Friday, Saturday and Sunday starting one hour before the store opens. The first 200 people through the door all three days will receive a CamelBak water bottle with a $5, $10, $25, $50 or $100 REI gift card inside. They will also have a gear package sweepstakes. If you're not already a member and sign up during this weekend you will also get a free REI OXT Tech T-Shirt, while supplies last. 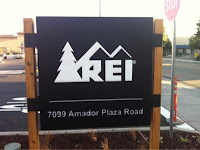 Pedal to the store, and they'll give you a 15%-off coupon and a free bike maintenance check by REI techs. Doors open at 10am all three days. 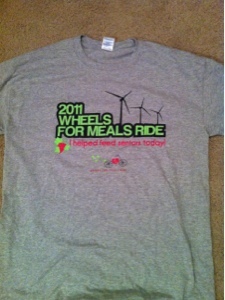 We did the Wheels for Meals Ride for the second year in a row. The bike ride benefits the Meals on Wheels Program in Alameda County. Again there was a 15 mile ride, a 35 mile ride and a 70 mile ride. We did the 15 mile ride last year and had planned to do a longer one this year but because we would be doing this the day before a race we decided to do the 15 mile ride again. We pre-registered online for $20 per person and were glad we did because the event sold-out. We drove out to Shadow Cliffs Regional Recreation Area and paid the $6 entrance fee. There are several paved and unpaved parking areas at the park and we ended up parking in a dirt/gravel lot. We got our bikes and gear together and rode over to the check-in area. In attempt to avoid congestion, the three routes were given a designated hour to be able to check-in and start the ride. We were able to check-in and start our ride between 9am and 10am. At check-in we received bibs for our bikes and a color coded wristband that matched our route markers on the ride. The route markers for the 15 mile ride were green so we followed the green route markers on our ride. The wristband would also be needed after the ride for our t-shirt and lunch, both of which were included as part of the event fee. There was water and bagels available before the ride. After check-in we got back on our bikes and headed through the parking lot and up our first hill to make our way out of the park. The route for the 15 mile ride was very similar to last years route. First we headed east on Stanley Blvd which was under contruction. Because of the construction we rode on the street itself instead of on the bike path we used last year. We then rode through some quiet and beautiful residential streets in Livermore. After about five miles we reached our first rest stop at Charles Borromeo Church. The volunteers here were dressed up in a patriotic theme, even the dog had a costume. They offered water, lemonade, candy, fruit and PB&J mini sandwiches. We had some snacks and rested in the shade for a few minutes before continuing on our ride. After a short while we found ourselves riding on Vineyard and Wetmore bike paths where we were rewarded with great views. After climbing and descending we found ourselves at the second rest stop. This stop was at Sycamore Grove Park. The volunteers here had decorated the area with a Hawaii theme and wore island attire. They had Hawaiian themed music playing as well. There was water, fruit, candy, jerkey and PB&J mini sandwiches. After another brief break in the shade we hopped back on our bikes and on the bike path. After some turns we made a right onto Isabel Road and continued on the bike path until we reached Stanley Blvd. We turned left here and road back to Shadow Cliffs. As we rode back to the Lakeside Picnic Area there were volunteers cheering us on. 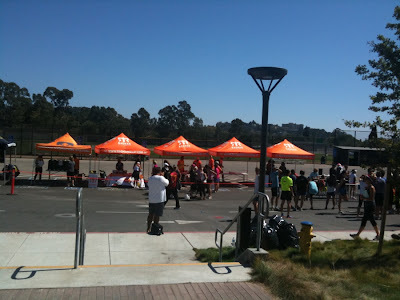 We found a spot for our bikes in the "Bike Parking" area on the grass and then picked up our event t-shirts. We then lined up for our BBQ lunch which consisted of ribs, sausages, chicken, muffins, potato salad, coleslaw and fruit. We took a short walk to a shaded picnic table and enjoyed our food. 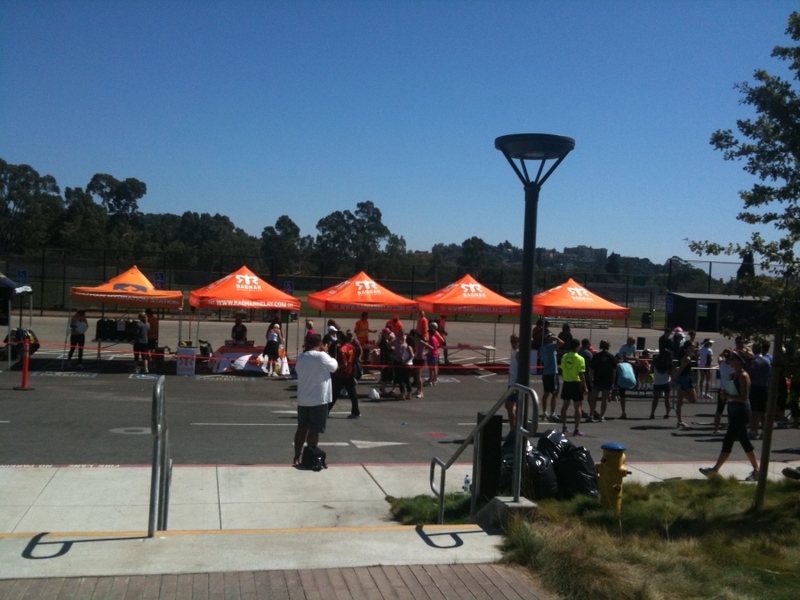 We passed by the sponsor booths on our way back to our bikes and then rode back to our car to head home. It was a great event again this year. It was very well organized and the weather cooperated-it was wam and sunny. We will definitely participate again next year, maybe we'll even do a longer ride. 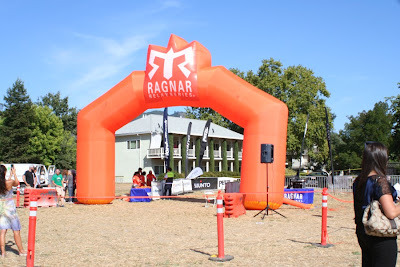 We recently got the opportunity to do Ragnar Relay Napa Valley. 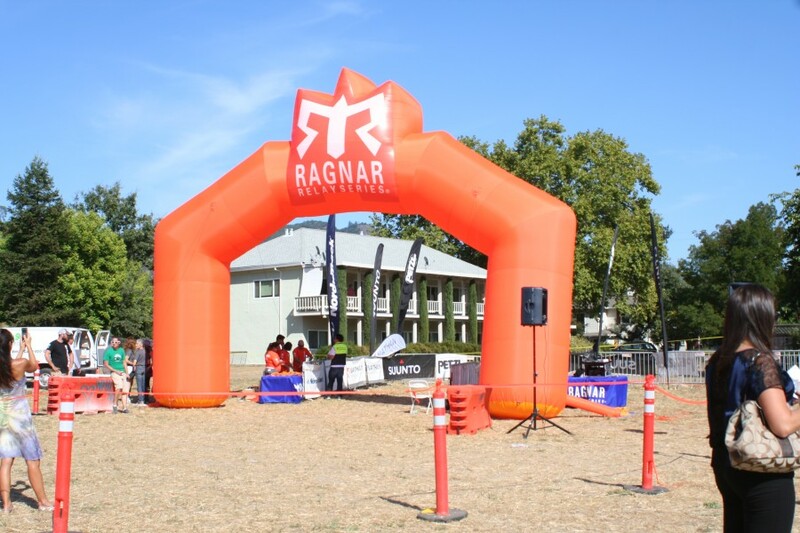 So what is Ragnar Relay? It's when 12 runners run about 200 miles, day and night, relay style. The Ragnar tag line is “Run, Drive, Sleep? Repeat”. Make special note of the question mark. So how about a few more details. The 12 runners split into two vans or other similar vehicles. Van 1 starts the relay and after each runner runs once, they then hand off to Van 2. Each runner in Van 2 runs once and then they hand back off to Van 1. This continues until each runner runs three times and the team as a whole completes 36 legs, passing a slap bracelet at every exchange. 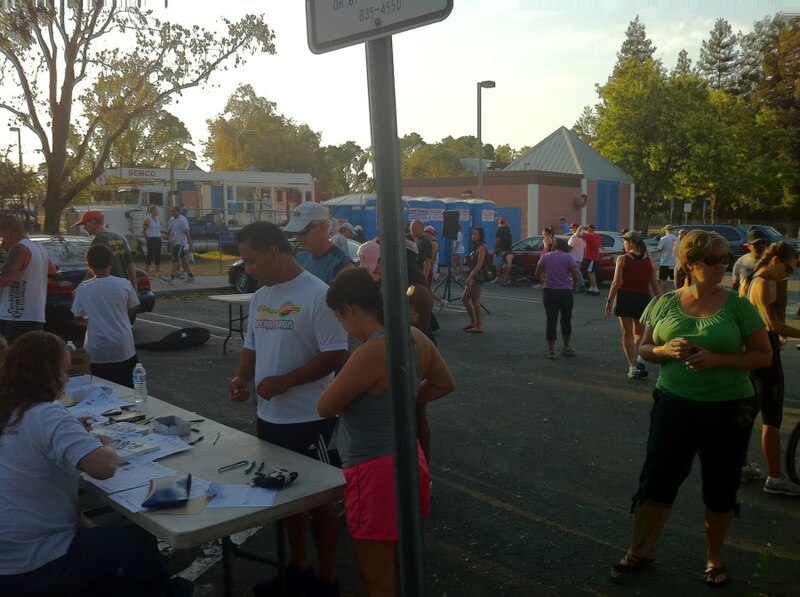 Each exchange has a parking area for the team vans and a designated area on the road for the two runners to hand off. Most also had porta potties which definitely came in handy. The exchanges where one van handed off to the other van were considered major exchanges and aside from the parking and porta-potties, many of them also had food for sale from local groups, water, sometimes coffee and hot chocolate and one had a sleeping area inside a high school gym. Each individual leg varied from the shortest being around three miles to the longest at about nine miles and have varying levels of difficulty. Each runner's total mileage varied from 13 to 22 miles. Most legs did not have any aid or water support but the team van was allowed to give aid to their runner. The few exceptions were those legs that were on roads where it would have been too dangerous for team members to provide aid and on those legs there were hydration stations. Most teams finish the race in around 30-something hours. Ragnar Relay has been around for several years but this was the inaugural race for Napa Valley. 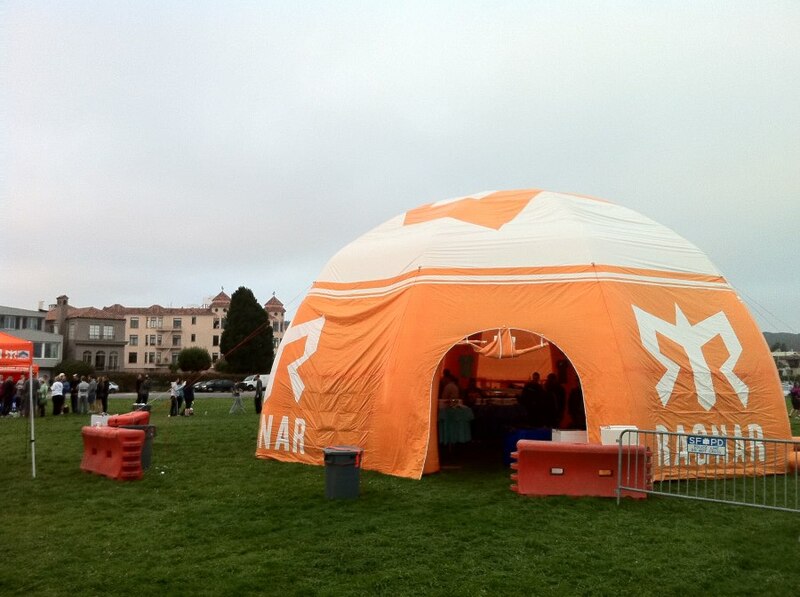 The race began in San Francisco at Marina Green Park. 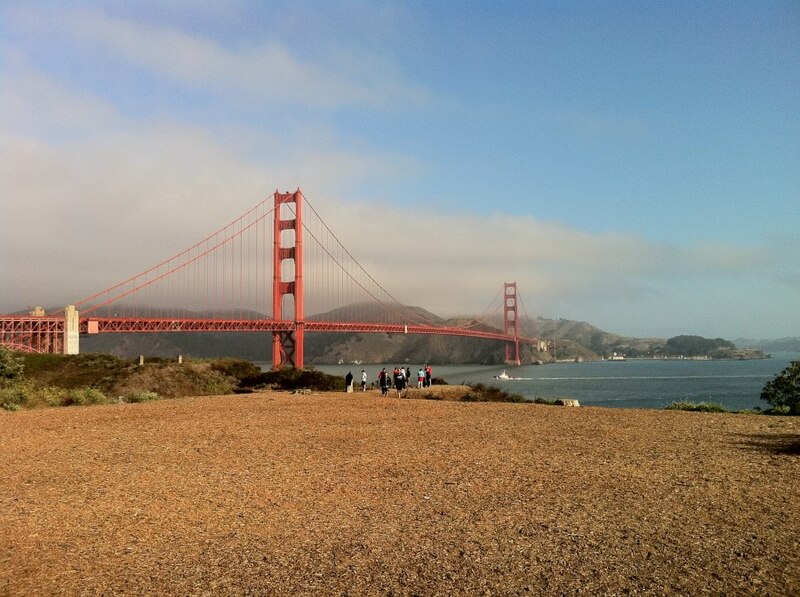 The race took us from SF, across the Golden Gate Bridge, through the north bay and eventually ending 186 miles later in Calistoga. In San Francisco there were staggered starts every 30 minutes starting at 5:30 am until about 3pm. Slower teams usually started earlier as they needed more time to complete the race. We reached the start an hour before our start time. We had to check in, show our safety gear and go to a safety briefing. Come 8:30am our first runner along with runners from 30 other teams took off and the race for us was on. Now the thing about Ragnar is that it's not really a competitive race, it's more about having fun. Teams usually come up with creative and funny team names. Many get custom made shirts for their team. Some teams are even out there running in full costumes. Van decorating are also a must do. Running is normally an individual sport and as runners we spend a lot of time running the roads by ourselves. Ragnar provides the unique opportunity to get 12 friends or even strangers and run as a team, supporting and cheering each other along the way. The fun aspect along with the challenge of the day and night race is what attracted us to participate. This was our first Ragnar, so despite researching as much as possible beforehand we didn't really know what to expect. First thing that surprised us was how rushed everything was. Not in a bad way. We thought that there would be a lot of time to kill, but there wasn't. It seemed like we were always in a rush to get ready to run, or get to the next exchange or get some food. 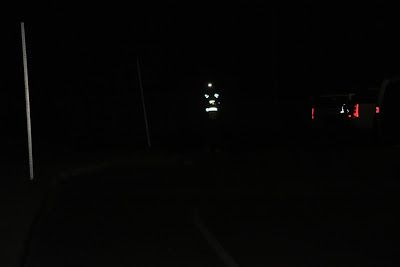 Running in the middle of the night was something I had really looked forward to. Some members of our team were worried about the night running. After doing it, running at night was a non issue. No problems, but not that exciting either. Running with oncoming car headlights in your face gets old pretty quick. The other issue with running at night is if you're running then you're not sleeping. 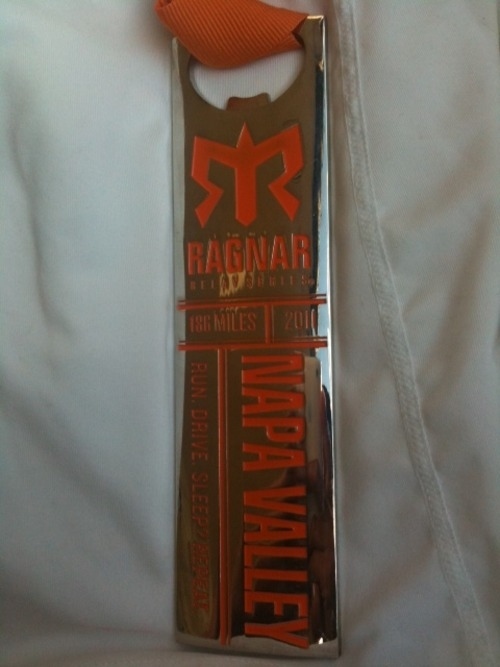 If you're doing Ragnar you should expect to only get a couple hours of sleep. In our team, Van 1 just slept in their van. Not exactly very comfortable but it was easy. 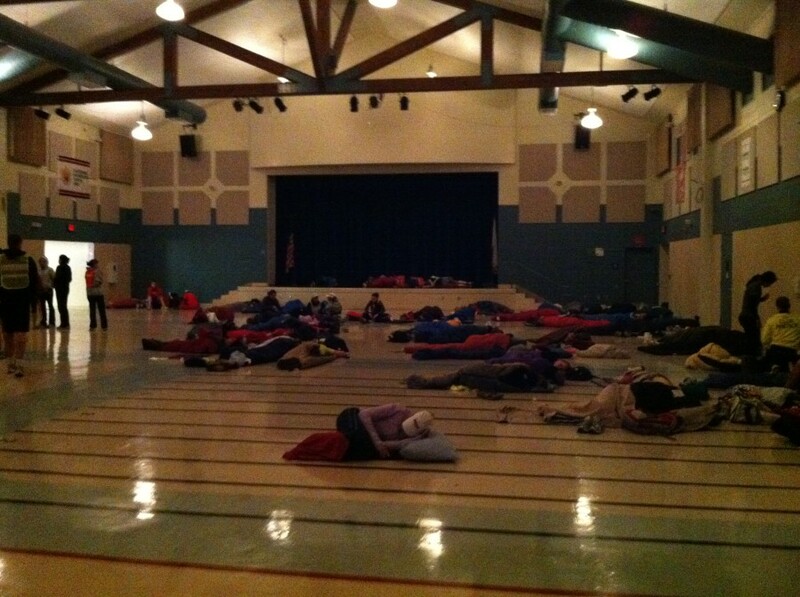 Van 2 slept in a high school gym at one of the major exchanges. While it was a chance to stretch out in our sleeping bags, a gym with 100 other runners who are all coming and going at different times doesn't make for a peaceful nights sleep. Food was another issue. I personally didn't eat enough during the race, probably didn't hydrate enough either. I didn't exactly get to keep to my usual meal schedule. So it was a lot of snacking, cliff bars and gels. During the last leg for the runners in Van 2 the temps actually got pretty high and they struggled to stay hydrated. We saw lots of other teams having to walk during this stretch of the race. But eventually we all made it to the finish. 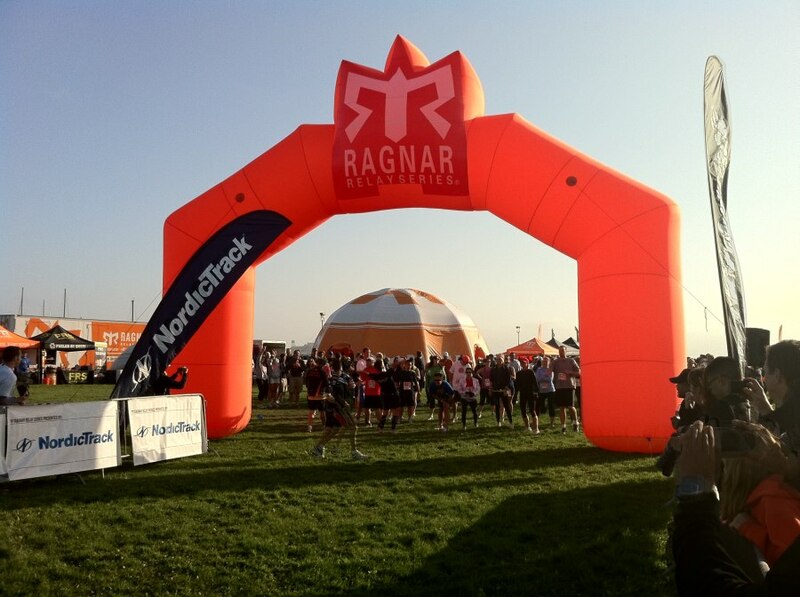 For Ragnar, the whole team joins the last runner to run the last 100 yards so that everyone gets to cross the finish. After crossing the finish line everyone got their medals and a team photo is taken. I must say Ragnar has some very cool medals. There is a finish line expo to checkout as well with a few product samples and actually every team got two free pizzas. Much needed as everyone was pretty hungry. There is also a merchandise tent at the finish. But I think the trick is if you want to buy some Ragnar gear purchase it at the race start as many things ran out by the time we got to the finish. 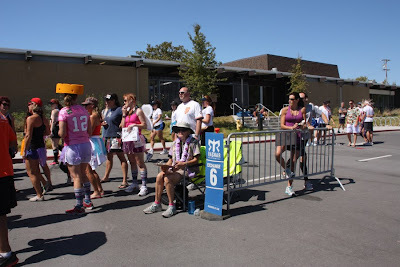 Overall Ragnar Relay is a very unique running experience. We had an absolute blast doing it. We had a great time with the friends on our team. We had a great time meeting runners from other teams. And we had a great time cheering for and getting cheered on by complete strangers. 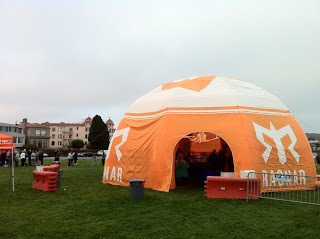 We will definitely be back for Ragnar Relay Napa Valley 2012. 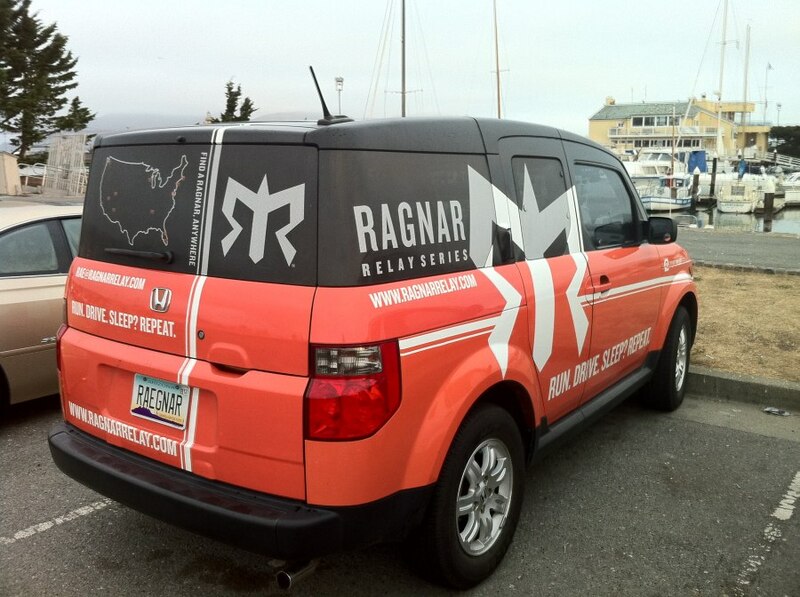 Actually we will probably try to do one of the other Ragnar Relays located around the country.